Are you considering Kitchen remodeling in Altadena CA? This is not a job for just any handyman or contractor. You need a kitchen design specialist such as Cabinet Magic. With Cabinet Magic on the job, you can rest assured every aspect of your project will be handled to the very highest standard. This includes not only the typical contractor work of construction and installation, but also help finalizing your design and finding the right products and materials. 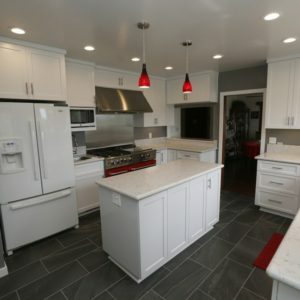 Kitchen remodeling in Altadena CA can range from simply updating the room with new cabinets, fixtures, and accessories to totally redesigning the floor plan. In either case, you may be concerned about how the finished project will turn out. After all, samples can look quite different in your hand than installed in your kitchen. With Cabinet Magic as your contractor, you’ll never get left in suspense regarding how your kitchen remodeling in Altadena CA will turn out. We know you want to feel confident of what you’re getting before you entrust us with the project. That’s why we offer 3D computer rendering services on every remodeling project. This way you can see every detail and approve it before we begin work. The centerpiece of any kitchen design is the cabinetry. Cabinet Magic has been creating stunning custom cabinets right here in California for nearly 30 years, and we can make your design vision a reality. Our skilled craftsmen can create any style of cabinetry and of course you will have your choice of finishes and accessories. Our cabinets are sturdily built to stand the test of time and incorporate high end features like soft-close hidden hinges and smooth drawer slides that make them a pleasure to use. If you are interested in working with Cabinet Magic for your kitchen remodeling in Altadena CA, please give us a call at 800-828-4380 so we can set up a free in home consultation with one of our knowledgeable team members. We can help you price the upgrades you want and give you a free estimate.